Summer is here in full swing, and there are trips to the beach, the park, and the zoo to take. Camping comes along for many, as well as trips to vacation resorts and theme parks. The amount of chemicals and plastic you could easily consume or use within a week can be overwhelming. But, it doesn’t have to be. With some careful planning in advance, you can have an eco-friendly summer! Carefully melt the shea butter and coconut oil in a double boiler until just melted. Add the zinc oxide powder and stir until the powder is all mixed in. This took a loooooong time for me to do. Add the essential oils and mix through. Store in the fridge. Use liberally and apply every 2-3 hours, or after swimming or heavy sweating. For me, this was just another place to cook, wash dishes, hang clothes and towels to dry and generally do “mom” stuff. But, I get to do it away from home and away from all the conveniences I would normally have, like comfortable seating, hot water from a faucet, etc. I still enjoy a good camping trip with my family, however, and we have learned much over our years of hitting the campgrounds how to do it with less trash and chemicals. We plan ahead and take our own food, in our own containers. Granola is what we normally pack for breakfast each day, along with some eggs from our backyard flock. We purchase a cow each year, and it’s packaged in it’s separate packages, so we still have that trash, but we bring hamburgers to cook, salad mixes from the garden and many times we will camp at a spot where we can eat the fish we catch. If that’s not an option for you, totally understood! Just bring as much homemade food along as you can. Crackers, cheese from a cut up block, etc., will go a long way toward not having trash to deal with. We also have a special camping set of dishes (available here) that are just for camping, and our emergency box as well, so we don’t have paper plates or plastic tableware to deal with, either. Add in a mason jar for each member of the family to drink from and you are nearly trash free while camping! Of course, packing enough water to drink each day has always been a difficult thing for us…we never seem to have enough! Last time, I had 10 gallons of water along, and we still needed to get more! We had those 5 gallon refillable bottles, so we were able to take those in and refill them. Ummmm…this one is honestly the hardest for me, because the one time our family did indulge in a theme park visit, we just went all out, and didn’t “care” about our trash. Looking back, however, here are some things we would have done differently. Call the park ahead of time, and see if coolers are allowed. Most will, but don’t allow glass…I know, right? But, safety of everyone involved, I can see why. If you are not allowed to bring coolers, bring a stainless steel bottle (available here) for water fill ups along the way. We made sure to eat a good breakfast before heading into the park, and I had some granola bars tucked into my purse as well. We had splurged on lunch at the park, and snacked on granola bars later that afternoon…but to be honest, we were so busy, we didn’t really care about eating. That is, until we left to rest at the hotel. At the hotel, we had food in the fridge, but that was more snacky stuff. So, we ate out nearly every meal those three days. Once in a while, you just gotta roll with the punches. What would you have on your eco-friendly summer list? I wish we had a zoo close by that we could visit for a day trip. The closest zoo is 2 hours away! Doable, but would require some planning…should probably plan it for this summer! We’re mostly planning on staying near home since we live in a resort town with lots of outdoors stuff to do. But we’re also hoping to take a road trip up to Oregon, which I’m really looking forward to. I had no idea you could make your own sunscreen!! How cool! We have a family history of skin cancer and very fair skin…I’ll have to bookmark this one for later! Thanks!! Very curious about this sunscreen. I can get these things so easily! I want to give it a try and see how it works on my trip to the beach. I’ve only been to two theme parks ever! Santa Cruz Beach Boardwalk when I was maybe 7, and then my husband and I went to Galaxyland in West Edmonton Mall for his birthday a few years ago. I’m really not much of a thrill-seeker, the rides freak me out! My husband made me go on the most horrifying roller coaster in all of Canada (I’m pretty sure it actually is just that), and it was so awful! 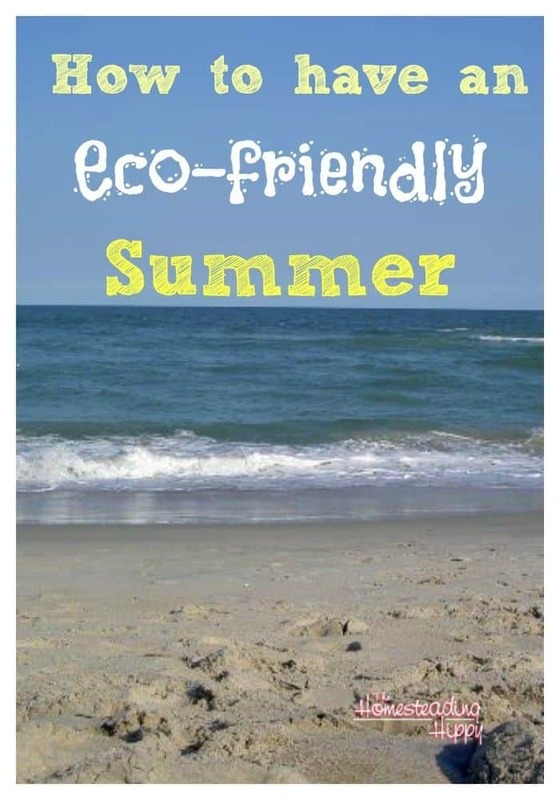 There are definitely lots of ways people can be really eco-friendly during the summer, including not littering on the beach or at any festivals or events they attend :)! My husband is taking the boys camping and he is taking washable plates this year. He also brings the 5 gallon water containers instead of store bought water. That sounds like a great sunscreen alternative, thanks for the tips! We are getting ready to do our family camping trip next weekend and we also have our camping set of dishes and lots of homemade food in our containers. I too didn’t know we could make our own homemade sunscreen…great idea! We live in the state of 10,000 lakes so we love beach time! We spend a lot of time swimming and hanging out, the best time of the year!! I love that you made your own sunscreen. I have to try that out.